Open the tag template, hold the shift key and d to duplicate and close the original. Delete each layer of the template as you go along also. My usual is to go to Image, canvas size 800 x 800, I always like a lot of room, you can always resize later. Being on the bottom layer of the template, fill with a color of choice, I used #6d4219, apply your mask, delete and merge group. You may want to resize your mask larger later. Select raster 6, new raster layer, fill with #f0c893, select none, apply PhotoEffex filter-Scanlines width on 1, spacing 2. Moving to the top layer, paste element 15, move down on the template and then move to just above the wheel layer, duplicate, mirror. Select raster 2, paste paper 2, invert, delete. Apply EyeCandy 4000 gradient glow with this color #f9efe5, width at 3. Merge copy of raster 3 down with raster 3 and paste the same paper #2, invert, delete. Apply the same gradient glow with this color #f9efe5, width set at 3. 1, 5, 1 both colors on white. Select raster 4, paste paper 1, invert, delete. Raster 8, paste paper 2. Copy of raster 7, merge down with raster 7, add noise at 40%. 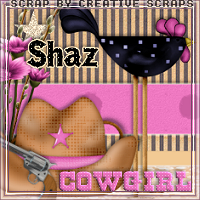 Vector 1, wordart Cowgirl, resize to 50%, select all, float, defloat, new raster layer, fill with color of choice, I used #ff97cc. Then apply the texture effect, weave with the same settings as before. Then select all, float defloat, expand by 2, add a new layer, fill with #f1d4bf, move below the wordart, add your drop shadow. Move to the left side more. (Resize and paste the following elements, arrange to your liking). element 25-size to 50%, place on right side. element 9-size to 30%, place on left side. element 22-size to 50%, duplicate resize again to 70%, mirror, place how you like them. element 26-size to 35%, place on left side. element 6-resize to 85%, then I duplicated, mirror and erased the parts I did not want. element 8-resize to 80%, move below the fence layer on the right. duplicate mirror, moving the mirror one below the hat layer. Being on the top layer, resize and paste your tube and place how you like it. Showing off the Signature and Avator I made to go along with the tag. Did not tut it, but all you do is take parts of your tag, resize to your liking and place how you want everything. Always rememeber to add your copyrights to all your finished tags.